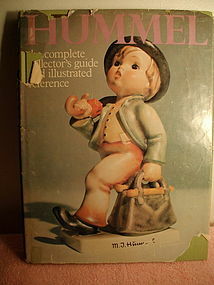 Hummel The Complete Collector's Guide and Illustrated Reference by Eric Ehrmann, published in 1976, jacket is rough but the book is intact. 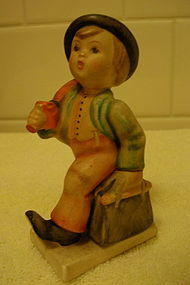 Merry Wanderer Hummel Figurine, Full Bee Backstamp (1950's), # 11 2/0, 4 1/4". 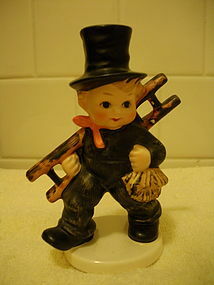 This little gent has a broken corner repair, looks good, he has also lost the end of his umbrella at the hand. Not bad for over 50 years old! 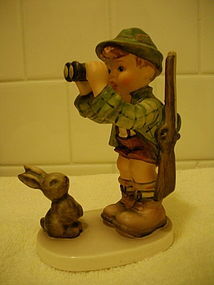 Good Hunting Figurine from Hummel, 1979-91 backstamp, # 307, 5 1/2". Very nice condition. 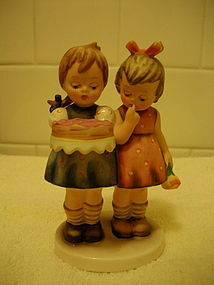 Happy Birthday Hummel Figurine, very nice condition. 1979-91 backstamp, 5 1/2", #176/0. 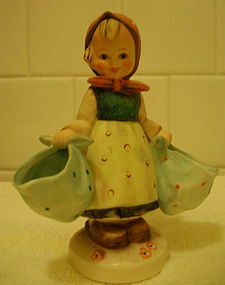 Mother's Darling Hummel Figurine, 5 1/2", #175, 1979-91 backstamp. Great condition. 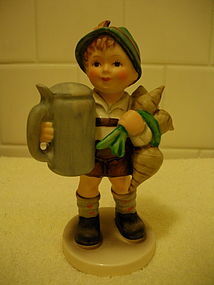 #143/0 5 1/2" Boots Hummel Figurine, great condition. 1979-91 backstamp. 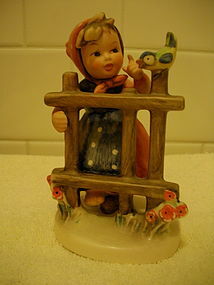 A Fair Measure Hummel Figurine, 5 1/2", #345, 1979-19 backstamp, great condition. #201-1 5 1/2" 1979-91 backstamp, Signs of Spring in very good condition. 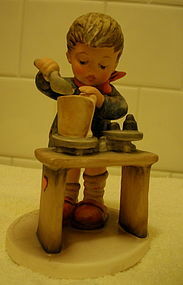 Chimney Sweep Hummel Figurine. Marked KF40 1979-1991 backstamp. 5 1/4" Nice condition, 2 small paint chips on the ladder. 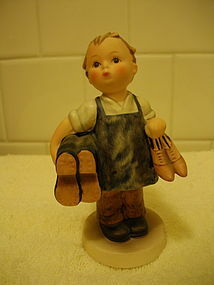 For Father Hummel Figurine, 5 1/2" 1979-91 backstamp, excellent condition.